Artichoke hearts are the fleshy, tender center of artichokes, nestled beneath the fiborous center choke. 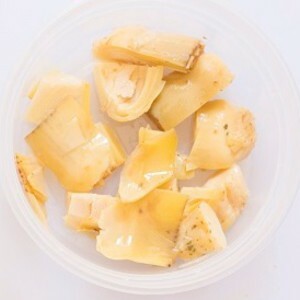 They can be cut from raw artichokes or bought frozen, but they are most commonly found marinated and packed in oil. Artichokes are incredibly high in antioxidents and are a good source of Vitamin K, folic acid, potassium, and dietary fiber. Marinated artichoke hearts are a popular ingredient in Mediterranean cuisine and, of course, the ubiquitous spinach and artichoke dip. Their vibrant and tangy flavor profile is a great accompaniment to fish and is often used as a topping for pizzas and more. Unlike whole artichokes, artichoke hearts are easy to eat- with no thorns or toughness to work around- though they should be cooked or marinated before eating. Artichoke hearts are delicious hot, cold, and at room temperature, so they're equally welcome tossed with piping-hot pasta or sprinkled into a salad.